I’m slowly getting back into the work groove and my studio is looking much cleaner and more organized. That is always the job and the goal for January. He’s got a little cross-cut wooden button for his belt buckle. Yes, that is George peaking out from our Lumberjack’s shirt. I’m heading down to Providence tomorrow to set up for the Art Providence show. I’m in booth 508. I have a few free tickets if you plan to come. Email me if you are interested- mimik@pobox.com. First come, first serve. 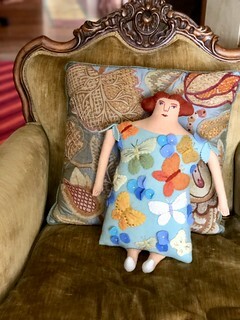 I am trying to make sure I have a good range of dolls for the show in Providence so I am all over the place! A reminder- my etsy shop will be closed for dolls (but not patterns) while I am doing the show- so that will mean Friday through Sunday. Then on Monday I will refresh the shop. This time I remembered his axe. I’m back to the men for this week and then owls because of my upcoming class. He has an axe too but I forgot to photograph him with it. Grrr. I am sitting here deciding if I should wait to rephotograph him before posting, which would mean tomorrow, or just get on with it. Guess which one I went with. He has a little wooden button belt buckle. Another cotton lumberjack, this time a blond big man. He has a wooden button on his belt. 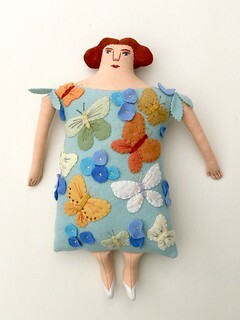 Wow, it has been a long while since I finished a doll. I have lots in motion but my goal for today was to get one finished up. And, success! This lumberjack is made of all cotton fabrics. I know, not exactly crazy times, but the others have been made of wool or a combo of cotton and wool. Using the cotton and wool fabrics together for the tattooed lumberjacks often led to problems with very uneven fabric stretchiness, which could mean men with very odd proportions. The lumberjacks I’ve sewed up so far are looking just fine! I hope all you friends out there are safe from all the crazy weather. Here in the Boston area we had exploding houses which still is unexplained. Very, very strange. Also, if you are looking to enjoy a crafty self-care day, check out the classes I posted- Tiny Worlds, Owls. It will be a day of handmade fun. I’ve been imagining this fellow for a long while so when I got back to the foxes, he was the first that I wanted to finish up. He had to wear the lumberjack classic red and black buffalo plaid, of course! And there is his axe, stored in his backpack. All his clothing and accessories are removable. He has his hatchet, a pear, and a handkerchief, stowed in the backpack. This is the last one for now. One more to go after this fellow! He is pretty classic with his red and black shirt. In this photo, you can see the faux-persian lamb texture of his hair. This wool fabric was from my mom’s fabric collection. I remember that it was from a coat she made- I disassembled it to save the usable parts. She used the fabric as a very subtle and classy extra zing on the pockets and collar of a black cashmere coat. I use it for lumberjack hair. In the way of how my mom bought fabric, I also have a white piece of the same fabric that she never cut into. I haven’t found anything to use it for yet either but I’m sure I will someday. ... and more in the shop.